White was writing at a time when dictators such as Hitler were flourishing almost unopposed (the quote is from his fascinating book of essays, One Man’s Meat). It’s rare these days to find a children’s book which challenges dictators and authoritarian regimes but there have been a few brave souls in the past – and their chief weapon was mockery. Adolf Hitler and the Nazis have justly been a major target. Another popular comic, Superman, took on Hitler in a story by Jerry Siegel and Joe Shuster, How Superman Would End The War, published in Look Magazine in 1940. Superman stops the war by twisting German gun barrels and then arresting Hitler and Stalin. 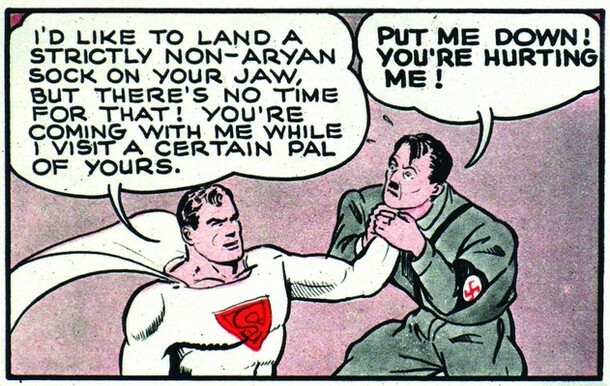 An SS newspaper in Germany attacked the Jewish Siegel with racist comments and accused Superman of corrupting American children (read the full article here). 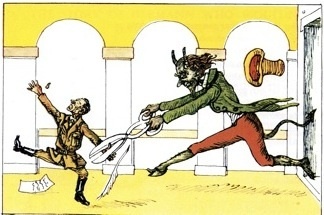 The most cheeky attack on the Nazis came from an English picture book, Struwwelhitler (1941) by Robert and Philip Spence, a version of the equally satirical Struwwelpeter (1845) by Dr. Heinrich Hoffman. 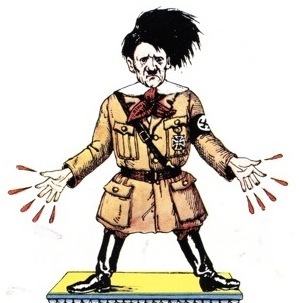 Published in aid of the War Relief Fund – ‘supplying games and woollen comforts to our Fighting Services’ – Struwwelhitler mocks the Nazi regime with cautionary rhymes about Hitler and his henchmen, who by then already had many years of blood on their hands. 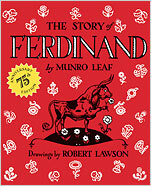 Ferdinand by Munro Leaf (1936) is one of the most influential children’s books and it’s never gone out of print because of its universal themes. 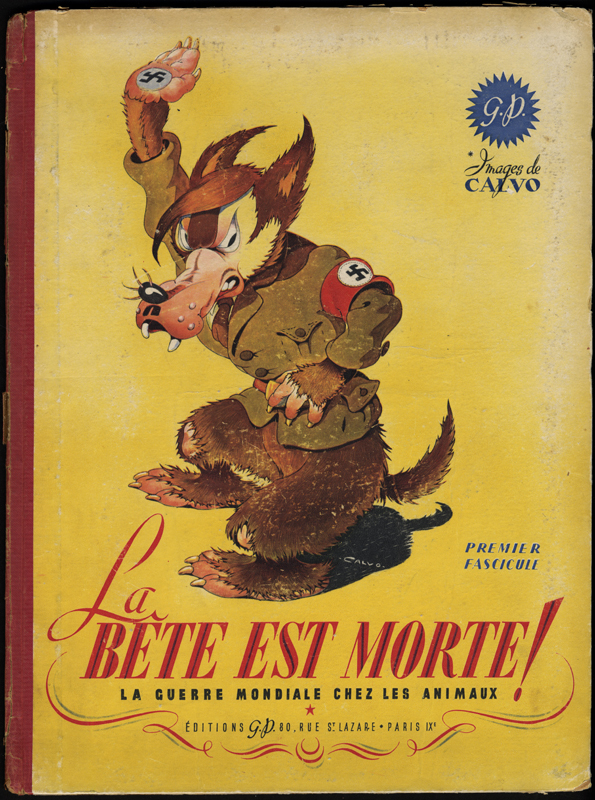 Although it’s message was subtle, the book was a particular target of dictators at the time: Ferdinand was banned by General Franco in Spain, burned by the Nazis, and Stalin responded by naming a gun after it. The tale of a bull who likes to smell flowers instead of fighting was seen as a pacifist message at the time of the Spanish Civil War; though it’s more a parable than a satire. Ferdinand is a free-thinker who chooses a peaceful lifestyle instead of following the crowd into an arena of violence and death. 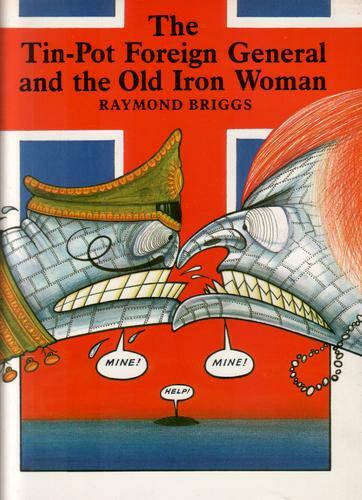 The Iron Lady and the Tinpot General by Raymond Briggs (1984) is a razor-sharp satire aimed at the Falklands War. It contrasts realistic black and white sketches of soldiers being killed and maimed in the war with two grotesque, luridly coloured dictators who are shown as metal monsters. Briggs also produced the devastatingly grim anti-nuclear picture book, When the Wind Blows. Neither book is suitable for young children. 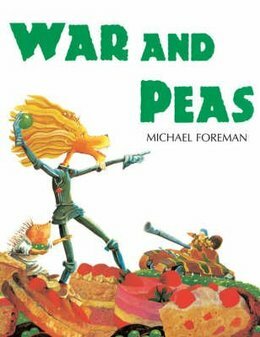 War and Peas by Michael Foreman is a gentler satire which pokes fun at military rulers using humour and a clever parable. The pictures appeal to younger children and the message reaches older readers; a balance only a great writer can achieve. It’s the tale of two countries: one hit by famine and other living in luxury. The gross inequality that fuels warfare is shown by a visual metaphor: a landscape made of food (mountains of cream cake!). The rich country invades the poor country (sound familiar?) but is beaten by a trick of nature in a happy ending.